Family Raised Beagle pups for indoor companion pets. All colors and sizes. up to date shots deworming. For approved Pet Homes only. 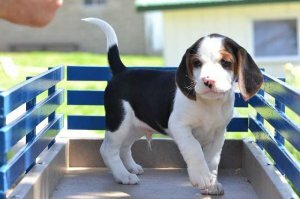 Our family has over 20 years experience selectively breeding and handraising beagle puppies to be indoor companion pets and outdoor sidekicks, for approved pet-homes only. We have all sizes and colors! Tricolor, and less shedding rare colors Chocolates, Khakis, and Silvers, and Oranges. Shots and dewormings kept up to date. We have puppies available now and newborns available in the future. View our in depth website to see pictures and learn all about our family and our companion beagles before contacting us. Once you've gotten a feel for who we are and appreciate our mission in raising beagles for pet homes only, please email us to tell us about yourself and your household for one of our babies, so that our family can also learn about you and feel comfortable moving forward and helping you adopt one of our babies to add to your family. We do not allow breeding, showing or hunting of our beagles- they are for beloved pet homes only. We take our time to handraise our puppies, and approve forever homes one by one after they go over all the helpful information provided from over our years of experience on our beagle website this allows us to better devote our time and efforts to raising our little family member, and meanwhile all our viewers interested in our family raised puppies can take their time to learn about us and our beagles via our website before contacting us to start to adoption process. Once you've done you're research and are ready to move forward with adopting one of our sunshine acres beagle babies, to add to your home now or preparing for a future timeframe, please tell us about yourself so we can approve you for the adoption of one of your favorites or to join the waiting list to find your very own sunshine acres lifelong companion beagle.